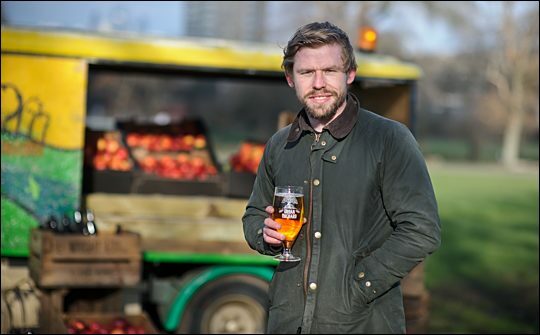 London-based Hawkes, has launched Urban Orchard craft cider made with a blend of culinary apples and apples donated by communities and individuals in urban areas looking to put their unwanted apples to good use. Following the successful launch of an alcoholic ginger beer, the craft cider will be Hawkes’ first foray into cider making. The apples used take inspiration from the apple varieties once grown, picked and sold on the streets of Victorian London by the apple-selling Hawker. Unlike like traditional ciders, Urban Orchard brings a truly unique experience with each bottle depending on the urban apples sourced for that batch. Passionate about mobilising communities and the part brands have to play within them, Hawkes’ innovative approach to cider making will see each donor get a personalised bottle and the brand will use their unwanted or unused apples for the good of the communities they live in. Apple donations from community groups including Father Nature and Brockwell Park Community Gardens, will also receive apple trees to plant in return for their donations, thus ensuring the prosperity and growth of these communities continues. Hawkes founder Simon Wright, an ex Greene King and InBev marketer, explains: “In all the years I’ve been in the industry, I’ve noticed a tectonic shift in the way consumers think about what they’re eating & drinking. People have a desire to become part of something real, from the people producing their beer and cider all the way through to how and where the ingredients are sourced and used. I wanted to create a truly London style blend, for our first craft cider, made for the people and inherently, by the people. I really hope that we can grow our list of community and individual donors over the coming years and that people buy into what we’re doing and why. The premium 4.5%ABV cider, the company says, is a medium dry cider, smooth and harmonious in body, complex and rich in texture with a crisp wine-like finish. It is available in 330ml bottles RRP £4.50 and 30L kegs. Apples used: Bramley, Braeburn, Cox, Jonagold, Ida Red, Gala, Golden Delicious and various unknown varieties (the magic!). The cider is being launched in independent bars, pubs and shops in London during February of 2015 and rolled out thereafter. Hawkes is aiming to open one of the first dedicated Cider houses in London at Forestgate, E7 in 2015.